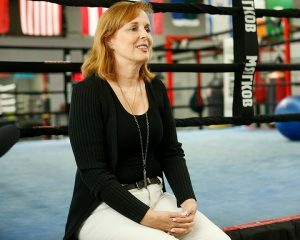 During the Sullivan Barrera vs. Seanie Monaghan media workout at the Mendez Boxing club in NYC, Boxing Insider had the pleasure of interviewing the CEO of Main Events Promotion, Kathy Duva. Boxing Insider – Boxing insider here with Kathy Duva. Kathy, what is your opinion on HBO no longer televising boxing? Kathy Duva – Oh I feel like it’s a death! It’s been 45 years! longer than I’ve been in the sport and they’re aren’t too many things that have been in the sport longer than me. I’m really going to miss it. Boxing Insider – Do you feel that with HBO getting out of the picture, is it going to have a huge impact on boxing how is being televised? Kathy Duva – I think it’s happening already. When boxing went to HBO, all the big fights started going there. The other networks lost interest because they couldn’t compete. But now you can see them on ESPN they’re already out there. FOX is already out there and there may be others coming up soon too, you never know. Boxing Insider – Rumor is that the Kovalev vs. Alvarez rematch is set to be on ESPN, is this true? Boxing Insider – How did you feel with the results of Kovalev’s last fight against Eleider Alvarez? Kathy Duva – Obviously I was not too happy. I think we saw this happening in the Ward fights. He got so tired, first of all Ward’s people did an amazing job of getting into his head, It was like watching a master class and I think I learned from it. Sergey was convinced that you had to try harder and work harder, because you know you’re a guy who like to party and have fun, and the worst thing for a guy who’s in his mid 30’s to do is to try and work harder because when you get older you have to work smarter not harder. Unfortunately, Sergey being Sergey just did not believe that. As he got tired, he would just continue to work harder and all he did was set himself up so that he runs out of gas. So now you have a guy who is 35 and is trying to fight and train like he’s 25. He needs to learn to train and fight like he is 35 and he’s doing that now with Buddy McGirt. He has made some changes to his training regime and hopefully it will all work out. Boxing Insider – So what you’re saying is we are going to see a different Kovalev come this rematch? Kathy Duva – yeah, you know Buddy is the guy who brought back Arturo Gatti and responsible for the incredible resurgence at the back of his career. Buddy knows what to do with an old fighter, and Sergey at his age has to start fighting like an old fighter which is not something negative. Some of the greatest fights you’ve ever seen involved guys who have that experience and are now challenged in the sense that they don’t have the stamina they once did when they were younger. All that plays into a guy who is a really dominant fighter suddenly getting into fights that are very competitive. So, I believe we are going to see that and in the end the fans are going to be very entertained. Boxing Insider – So coming into this rematch, do you feel Sergey will have a different outcome? Kathy Duva – you know Sergey won 5 out of the 7 rounds. He is by far the better fighter. The problem was that he ran out of gas after the 6th round. I remember leaning over to Sergey’s manager before the 5th round and said “I don’t know how he’s going to keep up this pace, what is he doing?”. Sergey’s going to have to learn to beat Alvarez at a slower pace and he is going to have to learn to train in a way in where he doesn’t leave it all in the gym. If he does those things he’s going to win, and if he doesn’t do those things he’s going to lose. That’s what’s going to make this fight very interesting. Boxing Insider – What is your opinion on what Eddie Hearn and DAZN are doing for boxing? Kathy Duva – You have people who want to invest in boxing. It’s a great time to be an elite fighter, so much opportunity for elite fighters. How can one be opposed to that, it’s terrific! Boxing Insider – What’s your take on Saturdays main event between Sullivan Barrera and Seanie Monaghan? Kathy Duva – This is a terrific fight! This is the greater fight that isn’t happening in places like DAZN, ESPN, or FOX. You’re looking at high level elite fighter, fighters who are world title fighters. If you look at the history of our sport, and I did the other day. I looked at all the “fight of the year” fights and what I found, dating back to 1922, is how rarely the “fight of the year” is one of the “BIG” fights. Its usually a fight like this. Look at when Gatti and Ward fought, you had two guys who people considered to be on the downside of their career and look at what they did! This is one of those fights, now I will never say a fight will be as good as Gatti and Ward, but what I am saying is that you have the same dynamic in fight with Barrera vs. Monaghan. I think if our sport is missing anything right now, its fights like these. Boxing Insider – Is there any other up and coming fighters under your promotion that you want fans to keep an eye out for? Kathy Duva – We actually have quite a few. Some of them you will see on Saturday, others you will see in the upcoming months. Leshawn Rodriguez (9-0 7KO) unfortunately had to pull out due to an injury but he’s a terrific fighter. Cassius Chaney (13-0 6KO) is a terrific heavy weight fighter. We just signed Denis Douglin (21-6 13KO) he’s one of those guys who has a lot going for him. He took some bad advice on a fight once and suddenly his career was going to waste, but no we are going to make a career for him. We have Madiyar Ashkeyev (10-0 6 KO), Meriim Nursultanov (8-0 5KO), Enriko Gogokhia (8-0 3KO) and Frank Galarza (20-2-2 12KO). We have a lot of really talented young fighters who are going to be the next generation of people you hear about. We to say this last big group of the Pacquiao’s, the Mayweather’s, the Klitschko’s they all lasted beyond the prime of fighters of generations past because we know more about nutrition, and training. They’ve extended their athletic careers so, it’s been a while since a new crowd has come along and took over. I believe this is going to be the beginning of that and I hope that the people I just mentioned and a few others are going to be in the vanguard of that and I look forward to being part of it. 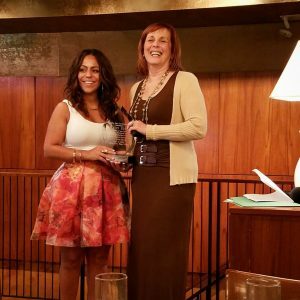 Boxing Insider – Thank you so much Kathy. Wishing you all the best. Kathy Duva has over 38 years of experience in the business of professional boxing and is the CEO of Main Events promotions. Kathy has helped promote many legendary careers such as Evander Holyfield, Fernando Vargas, Vinnie Pazienza, Lennox Lewis and many more. Tune in Saturday Nov 3rd for Sullivan vs. Monaghan live globally on Facebook Watch via the Golden Boy Fight Night Page beginning at 6:00 p.m. PT/ 9:00 p.m. ET. On Saturday night, Main Events stablemates and light heavyweight champions Sergey Kovalev(WBO) and Dmitry Bivol (WBA) will defend their titles in separate fights where a win by both could lead them right back to each other. With the fight taking place in Atlantic City, Kovalev and Bivol will not only defend their belts but act as global ambassadors for the sport to the area with big plans of it’s on. Plans to return the New Jersey city to the prominence it once held as one of boxing’s premier places to be. Photos of Sergey Kovalev during a media workout at The Boxing Laboratory in Oxnard, CA on July 26, 2018. Not to mention the large-scale plan Main Events has in the work in a new partnership with Facebook to increase the sport’s exposure. On an unseasonably hot southern California day, the Legendz Boxing Gym in Norwalk played host as Main Events chief Kathy Duva kept a watchful eye on Bivol on the young champion Bivol. As he worked out in the background for the Los Angeles media, Duva discussed the Atlantic City card, their new partnership with Golden Boy and Facebook to live-stream fights, and if Main Events is on the verge of signing their first female fighter. BI: Congratulations on your new deal with Facebook. How did that deal come about? The idea of this is, boxing has gone on every free media platform first from radio to TV to cable to premium cable to PPV and of course online. We are seeing all these over the top projects come to fruition and those are great because they will generate revenue, but they are all competing for those fights that are in the $2m to $3M dollar range; the HBO and Showtime level fights. That’s what ESPN is doing, that’s what DAZN is doing that’s what PBC has been doing all this time. In the meantime, there are all these fights that don’t get made or end up on the undercard and they kind of get ignored. Fighters need to learn how to be in the Main Event, they need to learn how to be the last guy to walk and I find in my experience that it’s not just for the sake of exposure but also for the sake of learning that you are THE man or THE woman. The need to have that experience. There are a lot of terrific fights that don’t get made on those big platforms. Our goal is to make those fights. BI: There was a time when fighters fought far more often than they do now. Do you believe with the increase in the number of platforms boxing is appearing, that current fighters will become more active or is it this just to add more volume? KD: At the moment people are kind of siloed with their fighters. There’re guys that fight on each of the premium networks and I don’t know if it will create opportunities for them. But what’s good about this is it’s totally free. The way it is structured we can put on as many shows as fans want to watch. As long as we have an audience, FB isn’t locked into a linear schedule like TV Network so there’s no limit on how many fights we can do. They can be viewed all around their world. There’s a whole big world out there and if we find out there’s an audience in that world that wants to see those fights, we’re going to get to do more. BI: We are here today for Dmitry Bivol. He’s come so far in a short amount of time. As he heads into this fight [against Isaac Chilemba] how does he feel and how does he feel to be part of this big rebirth taking place in Atlantic City? KD: Before I ever met Dmitry I heard about him and I remember telling his promoter from World of Boxing when you decide to bring him to the US please call me, and he did. He’s clearly the future, he’s very young, he’s incredibly talented and he’s got a beautiful career ahead of him. But for this moment we have Sergey Kovalev, the man in the light heavyweight division. He’s fighting and it’s only right that the guy who aspires to someday to be the man to fight on those cards and get exposed to the crowd, so people get to know him. BI: One last question, with Main Events, has long been a powerhouse and huge supporter of women, how close are we to seeing Main Events sign a female fighter? KD: It’s going to depend on the fate of this Facebook platform. The thing is, I don’t have a lot of fighters, never had a lot of fighters and I’ll never sign anyone I don’t think I can’t do anything for. Unless I get the freedom to say ‘Yes, you get to fight on this day, and you’re going to fight on this day, on this I show’ I can’t. I still have to depend on network executives to make these decisions and I’m not going to make promises to someone I can’t keep. Absolutely the day will come, we are struggling as is everyone in this business to create this mid-level platform, once we figure that out it will come.